Chiwetel Ejiofor (12 Years a Slave) is Everyman in Carol Ann Duffy's new adaptation. Everyman is successful, popular and riding high when Death comes calling. He is forced to abandon the hedonistic life he has built and embark on a last, frantic search to recruit a friend, anyone, to speak in his defence. But Death is close behind, and time is running out. Everyman explodes onto the stage in a startling production with words by Carol Ann Duffy, Poet Laureate, and movement by Javier De Frutos. 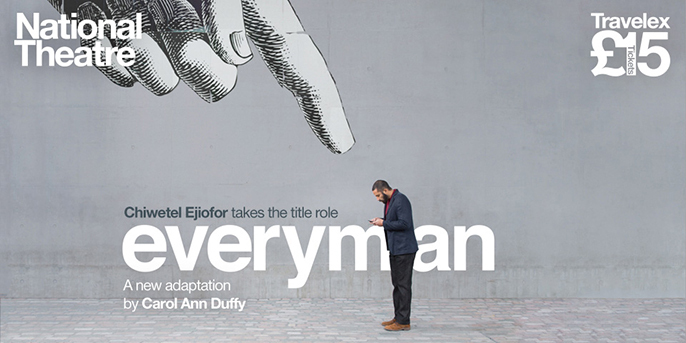 Enter promo code EVERYMAN15 when booking online to get £15 tickets to sold-out performances.